Rev-ErbA beta (Rev-erbβ) also known as NR1D2 (nuclear receptor subfamily 1, group D, member 2) is a protein that in humans is encoded by the NR1D2 gene. Rev-erbβ is a member of the Rev-ErbA family of transcription factors. Rev-erbβ, like Rev-erbα, belongs to the nuclear receptor superfamily and can modulate gene expression by directly binding to their promoters. 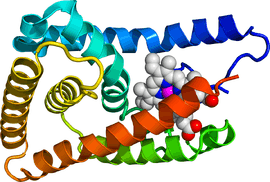 Cartoon diagram of the ligand binding domain of Rev-ErbA beta (rainbow colored, N-terminus = blue, C-terminus = red) complexed with heme (space-filling model, carbon atoms = white, nitrogen = blue, oxygen = red, iron = magenta) based on the PDB: 3CQV​ crystallographic coordinates. Rev-erbβ is similar to Rev-erbα in its protein structure and function as a transcriptional repressor. The crystal structure of an unliganded Rev-erbβ ligand-binding domain (LBD) has been resolved (see figure to the right) and shows an extremely small ligand-binding pocket. However, Rev-erbβ has been shown to interact with heme, which appears important for its function. 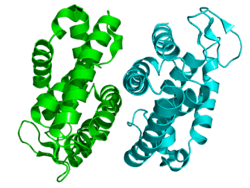 The structure of Rev-erbβ complexed with heme (see figure to the left) shows a substantial movement of helices 1 (N-terminus ) and 11 (C-terminus ) which opens up a large binding pocket in the interior of the protein that is able to accommodate this ligand. Rev-erbβ has been implicated in the control of lipid and energy homoeostasis in skeletal muscle. Rev-erbβ is also a circadian regulated gene; its mRNA displays rhythmic expression in vivo and in serum-synchronized cell cultures. However, it is currently unknown to what extent Rev-erbβ contributes to oscillations of the core circadian clock. However it has been shown heme suppresses hepatic gluconeogenic gene expression and glucose output through the related Rev-erbα receptor which mediates gene repression. Hence, the Rev-erbα receptor detects heme and thereby coordinates the cellular clock, glucose homeostasis, and energy metabolism. ↑ "Drugs that physically interact with Nuclear receptor subfamily 1 group D member 2 view/edit references on wikidata". ↑ Dumas B, Harding HP, Choi HS, Lehmann KA, Chung M, Lazar MA, Moore DD (August 1994). "A new orphan member of the nuclear hormone receptor superfamily closely related to Rev-Erb". Molecular Endocrinology. 8 (8): 996–1005. doi:10.1210/me.8.8.996. PMID 7997240. ↑ Koh YS, Moore DD (April 1999). "Linkage of the nuclear hormone receptor genes NR1D2, THRB, and RARB: evidence for an ancient, large-scale duplication". Genomics. 57 (2): 289–92. doi:10.1006/geno.1998.5683. PMID 10198169. ↑ Bonnelye E, Vanacker JM, Desbiens X, Begue A, Stehelin D, Laudet V (December 1994). "Rev-erb beta, a new member of the nuclear receptor superfamily, is expressed in the nervous system during chicken development". Cell Growth & Differentiation. 5 (12): 1357–65. PMID 7696184. ↑ Giambiagi N, Cassia R, Petropoulos I, Part D, Cereghini S, Zakin MM, Ochoa A (December 1995). "Rev-erb beta 2, a novel isoform of the Rev-erb family of orphan nuclear receptors". Biochemistry and Molecular Biology International. 37 (6): 1091–1102. PMID 8747539. ↑ Woo EJ, Jeong DG, Lim MY, Jun Kim S, Kim KJ, Yoon SM, Park BC, Ryu SE (October 2007). "Structural insight into the constitutive repression function of the nuclear receptor Rev-erbbeta". Journal of Molecular Biology. 373 (3): 735–44. doi:10.1016/j.jmb.2007.08.037. PMID 17870090. ↑ Raghuram S, Stayrook KR, Huang P, Rogers PM, Nosie AK, McClure DB, Burris LL, Khorasanizadeh S, Burris TP, Rastinejad F (December 2007). "Identification of heme as the ligand for the orphan nuclear receptors REV-ERBalpha and REV-ERBbeta". Nature Structural & Molecular Biology. 14 (12): 1207–13. doi:10.1038/nsmb1344. PMC 2743565 . PMID 18037887. ↑ PDB: 3CQV​; "Human nuclear receptor subfamily 1, group D, member 2 in complex with heme". The Structural Genomics Consortium (SGC). Retrieved 2008-08-09. ; Pardee KI, Xu X, Reinking J, Schuetz A, Dong A, Liu S, Zhang R, Tiefenbach J, Lajoie G, Plotnikov AN, Botchkarev A, Krause HM, Edwards A (February 2009). "The structural basis of gas-responsive transcription by the human nuclear hormone receptor REV-ERBbeta". PLoS Biology. 7 (2): e43. doi:10.1371/journal.pbio.1000043. PMID 19243223. ↑ Ramakrishnan SN, Lau P, Burke LJ, Muscat GE (March 2005). "Rev-erbbeta regulates the expression of genes involved in lipid absorption in skeletal muscle cells: evidence for cross-talk between orphan nuclear receptors and myokines". The Journal of Biological Chemistry. 280 (10): 8651–9. doi:10.1074/jbc.M413949200. PMID 15623503. ↑ Yin L, Wu N, Curtin JC, Qatanani M, Szwergold NR, Reid RA, Waitt GM, Parks DJ, Pearce KH, Wisely GB, Lazar MA (December 2007). "Rev-erbα, a heme sensor that coordinates metabolic and circadian pathways". Science. 318 (5857): 1786–9. doi:10.1126/science.1150179. PMID 18006707. Ramakrishnan SN, Lau P, Crowther LM, Cleasby ME, Millard S, Leong GM, Cooney GJ, Muscat GE (October 2009). "Rev-erb beta regulates the Srebp-1c promoter and mRNA expression in skeletal muscle cells". Biochemical and Biophysical Research Communications. 388 (4): 654–9. doi:10.1016/j.bbrc.2009.08.045. PMID 19682428.